This type of battery, based on the Idealized Storage model, allows users to size energy and power independently. The Idealized Storage Model replicates a simple storage model that assumes a flat discharge curve because the supply voltage stays mostly constant during the discharge cycle. For this model, you need to enter only the nominal capacity in amp-hours. HOMER uses this as the actual capacity of the storage. Some high performance Lithium Ion batteries, for example, can be modeled well with an Idealized Storage model. To learn more about this model, see the Idealized Storage Model section of the help. This section contains information about the nominal voltage, nominal capacity, and maximum charge and discharge current of the idealized battery. 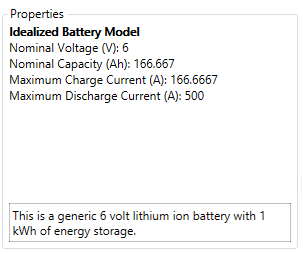 This battery is based in the Idealized Storage model, which assumes a flat capacity curve. This section also explains how to specify an idealized battery in a HOMER model. You can specify the lifetime of the supercapacitor bank with the lifetime inputs that appear just below the cost table. You can specify the lifetime in years, or throughput in kWh. If both time (years) and throughput (kWh) are specified, the component replacement occurs according to the one that occurs first. The Site Specific Input section allows you to enter parameters that might change from project to project. The Initial State of Charge input (in percentage) sets the battery's state of charge at the beginning of the simulation. The Minimum State of Charge input (in percentage) sets the lower limit on the state of charge.